It has been awhile since I’ve written about food–a large part of mine, as well as many other people’s lives. Perhaps the documentaries I have seen as of late on the obesity rate in the United States, added to my concern of everything (okay, mostly everything) I put into my body, have increased my awareness of the food that is consumed on a daily basis. And when I read reviews of diners in Dutchess County, it was only a matter of time–or a matter of hours in my case–before I dragged a friend to have breakfast with me at a diner in the area. It is called “Another Fork in the Road, a Finer Diner,” located in Milan in Dutchess County, almost to the Taconic Parkway. I have passed it numerous times, with the same thought in my head each time I pass it: Who would have a restaurant there? Along with the sign, and the fact it is a small building almost in the middle of nowhere, are probably why I have never eaten at this Diner. I love old Diners. The atmosphere. The greasy, unhealthy food served; the fact you can order breakfast all day; the unlimited supply of (usually) normal tasting coffee. This, however, is a different diner. As in the title, it is a “finer diner,” a place many have surely missed on their way from the Taconic towards Red Hook or Rhinebeck as it is simply a wooden building with windows. The “finer” aspect of the diner refers to the fact that everything there is fresh. All ingredients– from the meat products to the vegetables–are local, organic, and fresh (I know! A diner? Crazy!!). And, everything is very reasonably priced. *Consumers note: they only take cash. We arrived around lunchtime to find a large room with wooden tables, chairs, a small bar, and children’s play area. The waitress allowed us to sit where we pleased, and was quick to bring menus and our drink orders. The restaurant was pleasantly quiet, despite being full. As with every other restaurant, I am one of the most indecisive people when it comes to ordering food out. The waitress was very informative in giving her suggestions in what was good to eat there (next time, I’ll be sure to get their homemade mozzarella). After much contemplation I settled on the Winter salad with a side order of french fries (fried food craving), and X ordered some type of Corned Beef Hash. Alas, the food took no time whatsoever before it was served, and a salad filled with arugula, spiced walnuts, silvered apples, a type of crispy thing I cannot recollect the name of it, and a side of maple dressing was placed in front of me, along with a side order of perfectly cooked, organic, locally farmed french fries. Before I go any further, I need to stop here and say two things which struck me. The first was that they did not put salt on the fries–it is a pet peeve of mine when french fries are served to me drenched in a bath of salt. They were crisp, and yummy. The second is about the cranberries in the salad. 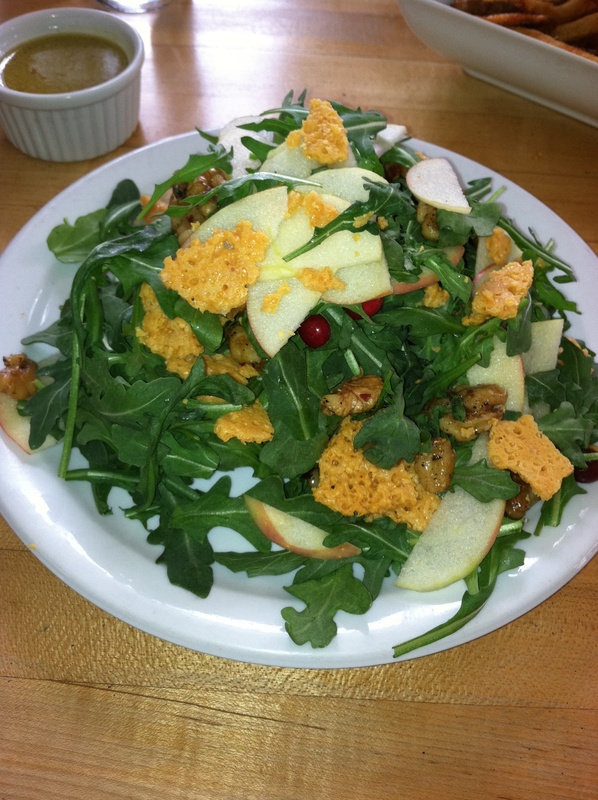 Being vegetarian/vegan at points/ raw, I’ve had my share of “winter” salads that come with nuts and apples and cranberries. I was taken aback when I forked through the leaves to find normal, fresh cranberries. Every other salad (I kid you not) like this one has had cranberries, but in the form of craisins–dried. And, they added a sweet/tart flavor to the salad, instead of the almost-pure sugary sweet taste of craisins. Amazing! The food was satisfying, filling, and tasty. 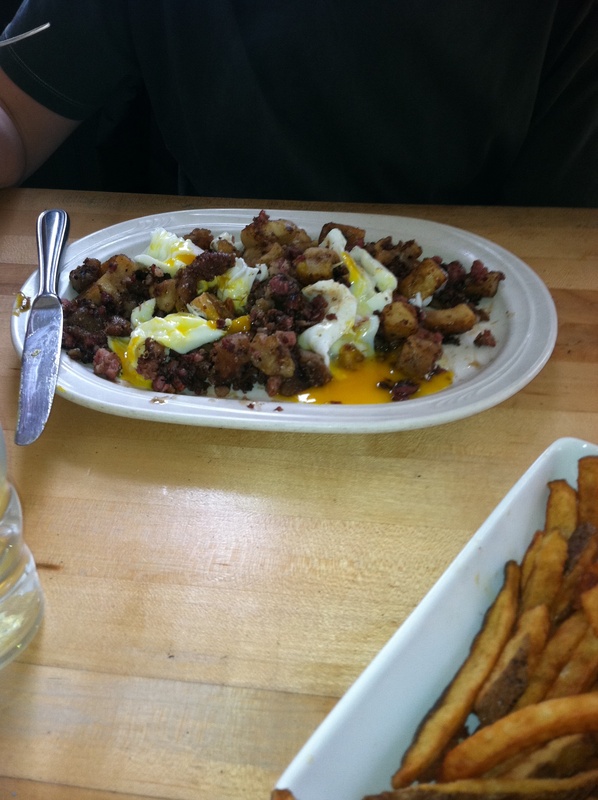 According to X, the Corned Beef Hash dish he had (including corned beef, a poached egg, and diced potatoes) was quite delicious. At no time were we rushed by the staff, but we were checked on by our waitress a couple of times throughout the meal. FYI they serve dinner now, along with the breakfast and lunch. In short, if you are looking for an upscale diner dining experience in the Dutchess County that is fairly priced and delicious–a change from your normal diner fare–definitely check out Another Fork in the Road. It will not disappoint!